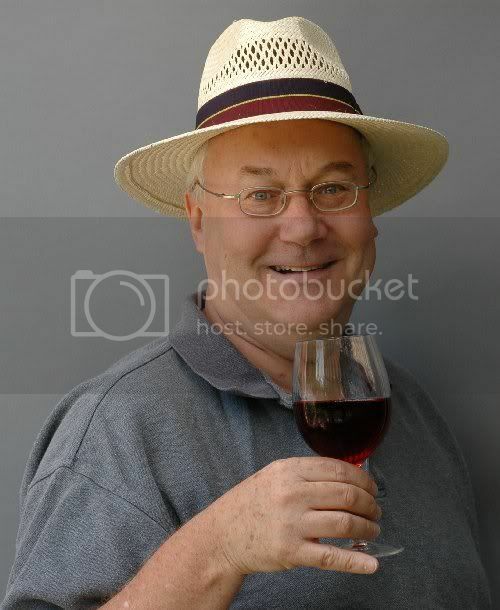 This is Piet Kleinhans, winemaker at the newish Pulpit Rock winery in Swartland. His first two Pinotages achieved Top 10 wins in 2006 (for the 2004 vintage) and 2007 (2005 vintage). The 2004 vintage created quite a stir at the tastings I presented at the London International Wine Fair, and the Chairman of the Central London Wine Society, a noted Pinotage sceptic, even insisted that I include it at the next tasting of South African wines that I presented to their club. 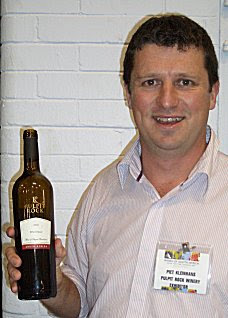 So I was keen to taste the 2005 vintage when I met Piet at the Wines of South Africa tasting in London a few months ago. Very dark black/red colour; really upfront fruit with intense sweet berry and redcurrant flavours and tannins coming through on the finish. Piet told me that it had spent 15 months in new oak barrels, 70% French 30% American. I am not surprised that it went on to impress the Top 10 judges. This is delicious drinking now. I wonder if anyone will keep it long enough to see what its like in 5 years? Pulpit Rock's Pinotage is indeed a very delectable wine. Visiting the cellar and meeting the wine maker and the people behind the wine is even more rewarding. The cellar is situated in the beautiful Riebeek Valley, about 85km north of Cape Town. I'll be in the Cape in February and so I'll add Pulpit Rock to my list of wineries to visit. Stormhoek Pinotage -- lets drink it! Stormhoek -- "Opportunity for Reinvention"
Spier Private Collection 2002 -- Wow! !